The scene at Overland Expo West just outside of Flagstaff, Arizona defines the adventurous spirit. It’s a place where Urals are right at home. The guys at Kalaber Creations are regulars here, known for hosting a Ural campsite full of their own sidecars and attendee rigs. Here’s a photo re-cap of their time at the recent 2018 event. 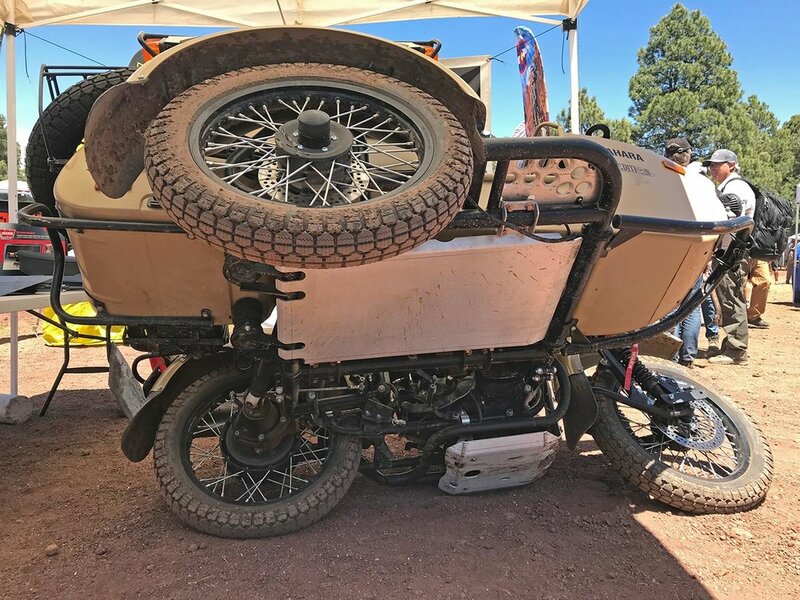 Please enjoy this weeks Total Motorcycle Rider Inspiration: Overland Expo West 2018 Event at Flagstaff, Arizona. 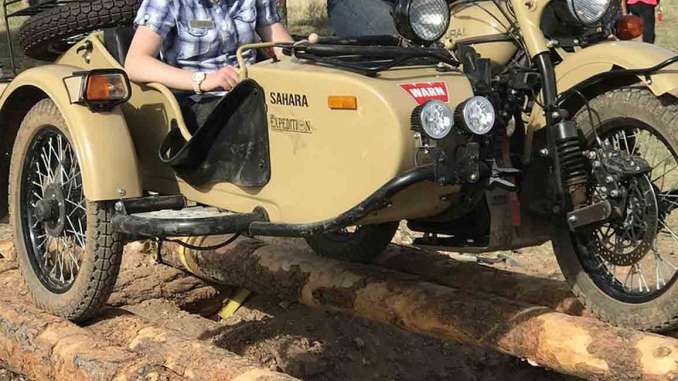 Kalaber owner and experienced adventure traveler, Mark Tetreau is a Ural dealer from Prescott, AZ who has developed several Ural accessories of his own design. He has been attending Overland Expo West since 2012. This premier overlanding event features countless adventure-related vehicles, gear, and variations of aftermarket equipment. Many of the sidecars on the grounds were mobile showrooms, customized with bags, hardware and travel enhancements. 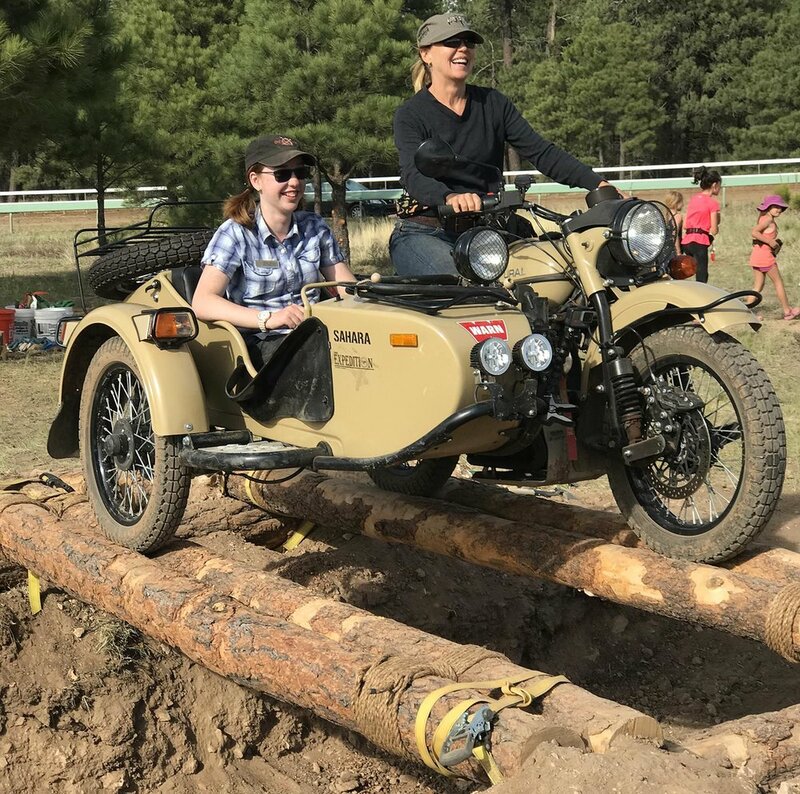 It’s become an annual challenge for a growing group of women to hop aboard a Ural and power it forward for a certain distance. This year, they smashed the record with 17 passengers and 1 pilot. The sidecar community is abundant here. These outdoor enthusiasts like being ready for any kind of terrain and whatever mother nature throws at them. That’s why the Urals are crowd-pleaders here. Several sidecar riders displayed their rigs at the Kalaber booth since many of Tetreau’s bikes were being used in demonstrations and by show organizers. Elspeth Beard and Carla King: Many, many miles have been logged on motorcycles by these accomplished women. At one point, a Ural caravan was seen parading through the grounds nearly 20 sidecars deep. So, if you plan on attending next year’s Overland Expo West, you’ll definitely see many Urals crawling around the event. If you’re on the other side of the country, you can also check out Overland Expo East in Asheville, NC. Adventure motorcyclist and travel writer, Carla King, takes a ride over the recently-built log bridge. URAL motorcycles, Kalaber Creations, Overland Expo, for this week’s Total Motorcycle rider inspiration story encouraging you to GET OUT THERE AND EXPERIENCE IT on a motorcycle! Each week Total Motorcycle brings you a different rider inspiration story to promote motorcycling and motorcyclists around the world.